Keith Clark is on an epic ride in South America, for which he has made meticulous preparations. 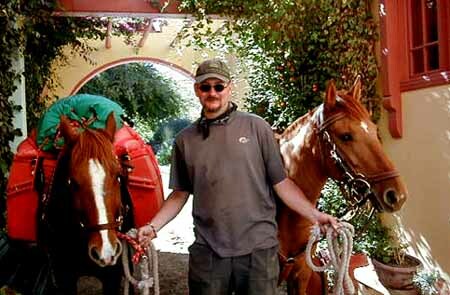 "I am starting a journey on horseback in South America. I hope to complete a circuit of the Southern Andes starting in North Chile. I'll then ride as far south in Chile as I can. I'll then cross over the Andes to Argentine and ride north to Bolivia. Hopefully [funds permitting] I'll continue on to the Atlantic coast of Brazil which I think will make a good contrast to the Andes." Click on either picture to enlarge it. Please click here or visit Keith's website for more information. We at The Long Riders' Guild wish you luck and safety on your journey, Keith.